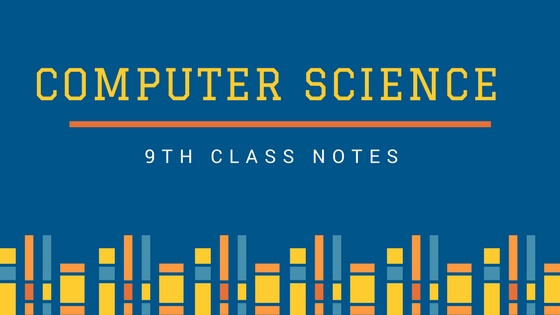 If you're looking for the 9th Class Computer Science notes with solved exercises, then you have come to the right place. It has solutions of all the 8th chapters. It doesn't matter either you're a brilliant student or not, you will need notes. These notes would help you in getting good marks in exams. It has to the point answers so that you don't need to read the whole book to get your job done. I would say don't memorize notes for the sake of getting great marks, but do with the purpose to improve your life. Computer Science is considered the best field all over the world because all the future depends on such fields. That's why I have said many times that becoming a doctor and an engineer is not the only way to be great in the world. Computer Science graduates will earn more money in the future thanks to virtual reality, augmented reality, artificial intelligence, and machine learning technologies. In this first chapter, a detailed introduction about the computer is given in simple words. Charles Babbage's work, advancement in the computer during 1950's and 1960's, five computer generations, analog and digital computers, pocket, laptop, and microcomputers and supercomputers are depicted. And much more! The second chapter of computer science is technical where the core concepts about software, hardware, input-output, software copy, hard copy, CPU, ALU, System Bus, port are given. You can make use of Google if you don't understand a term. Google Uncle will help you in this regard. This chapter is all about the input and output devices. You have to check either mouse is an output or input device. Similarly, you have to decide the fate of joystick, scanner, microphone, light pen, digital camera, trackball, monitor, printer, plotter. After the reading chapter, you will have clear idea about CRT and LCD. Even if you don't get the concept, you can watch this video about input and out devices. This chapter is all about storage devices i.e., RAM, DRAM, SRAM, Cache Memory. Then it comes to hard disk, floppy disk. Now the world has moved to SSD which is a lot of time faster than harddisk. I hope this book would change. This chapter may be difficult for you. Here the explanation of Data, Number System, Binary Number System, Hexadecimal Number System, Binary Addition come into play. As well as you need some maths skills. But don't worry, the exercises would be easy if you get a good teacher. Even you don't get a teacher, Youtube is your best friend. This chapter would be easy for you if you have read about the gates in Physics i.e., NOR Gate, AND Gate and NOT Gate. The simple answers to the questions about Boolean Algebra, Proposition, Boolean Constants, Boolean Variables, AND Operation, OR operation, and NOT operation are explained well. This chapter is more software oriented. After reading this chapter, you will have concepts about Computer Software, Application Software, System Software, Disk Operating System, Command File, Executable File, and all the commands of DOS. This chapter is interesting if you do practically. By opening command on your laptop, and tell practice the commands written in these notes. This chapter would be the most interesting chapter for students. Some students wish I could be the first chapter because it is what every laptop has. If you're downloading these notes, I can say, you know 70% of this chapter already. This chapter is about simple things like Icon, Folder, File Extension, My Computer, Internet Explorer, Windows Desktop. 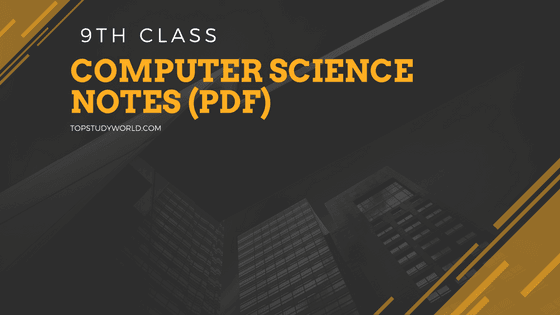 Now it is easy to download the PDF of 9th Class Computer Science notes with solved exercises, even you can read online without downloading anything.